A pristine and picturesque morning calm greeted me as I sipped my coffee waiting to commence our underwater adventure in Exuma Cays Land and Sea Park. Warderick Wells is the perfect base of operations located near the center of the 176 square mile national park system of ECLSP the oldest marine park in the world, providing easy access to some of the most vibrant and exciting dive locations found anywhere in the Bahamas. The agenda for the morning was our famous shark dive at “Danger Reef”. 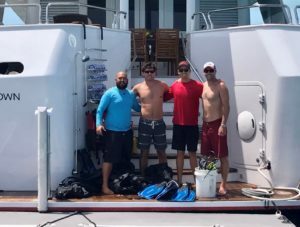 The guests from the Motor Yacht Lady J, had stopped by the dive location the day before but were hesitant to get in the water with such a large congregation of sharks in the wild. 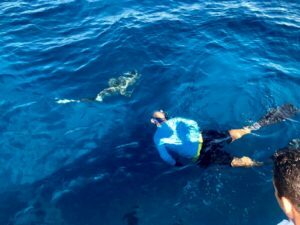 They needed a little native expertise and experience to get them into the water, and asked if one of the ECLSP Wardens – Guides could accompany them. Approaching danger reef we encountered two other vessels, already diving this ocean location. Instead of waiting around, we decided to try out another dive site, named “3 peaks” just north of us. 3 peaks is a near edge deep reef dive spot with towering coral heads and terrace-like drops leading to the drop-off. Large black grouper and schools of jacks patrol this area as well as the occasional Caribbean reef shark. This particular dive was a little murky and I was disappointed with the fish activity but when we broke the surface, all around me were exclamations of enjoyment and wonder! I must be spoiled spending so much time in the park that I almost forget how splendid this place truly is. With the decision to use our second tanks, we waited around cruising the area on the glass calm ocean contemplating our next dive. We were stuck between doing a drift dive, or waiting for Danger Reef to become available, in the end we decided against the drift dive as the water clarity was less than perfect and the tide was ebbing, less than optimal for a drift dive. While the rest of the divers suited up, I decided to forgo the scuba gear and free dive for this adventure. Danger reef as always lived up to its reputation with a dozen reef sharks in the area before we were even in the water. 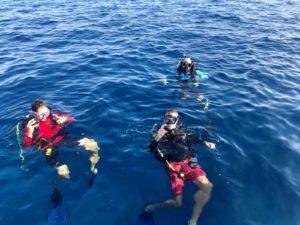 I dove around searching out interesting coral formations or pointing out various fish species to the Lady J guests and divers. We saw Black Groupers, Tiger Groupers, Nassau Groupers, Hog fish, Spotted Eagle Rays, various Jack species and other reef fish. Towards the end of the dive A King Mackerel swam several circles around us putting on quite a show before disappearing back into the gloom. 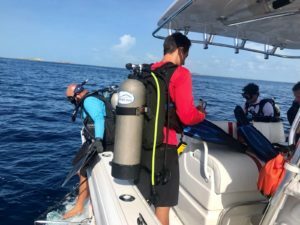 This was my first experience as an Exuma Cays Land and Sea Park Guide leading a scuba tour and I have to say I thoroughly enjoyed it as did the guests. 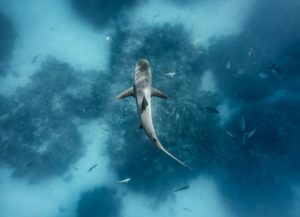 Once they saw me in the water with the sharks, remaining calm, it was like I had unlocked the door to the secret garden for them. They won’t soon forget the experience! 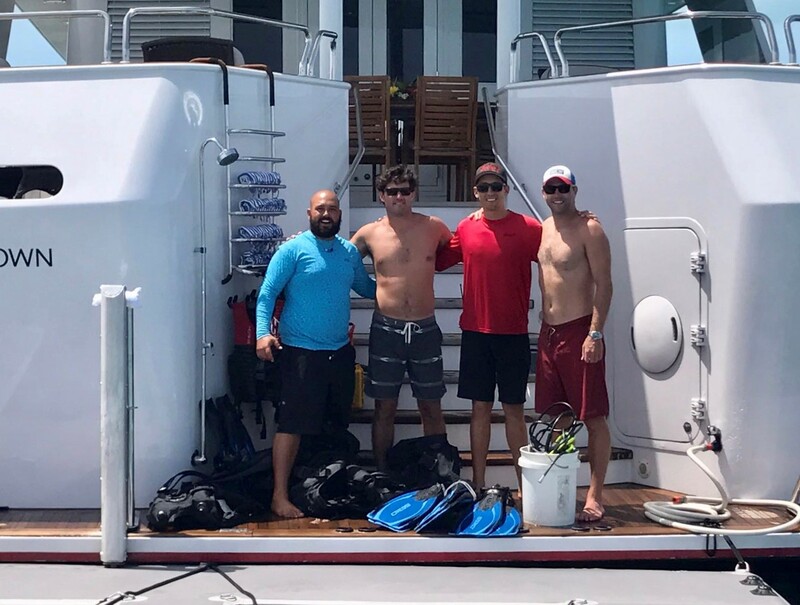 Once ashore the Captain of Lady J requested if this could be organized again, for future guests and dive enthusiast, as they loved the knowledge and expertise the ECLSP team brought to their guest’s experience of ECLSP. Absolutely was our reply. This is one of the many experiences the ECLSP team is now offering to all visitors of the park. The fee for this guided dive excursion is $250 and is just another source of income for the park to help pay for our operations.